How do you carry out your survey? Data is collected using a seven-day listening diary. Approximately 110,000 adults 15+ are asked to fill one out over 50 weeks of the year. Read full details of the survey. Can I find out the audience for a specific station? Go to Quarterly Listening. When the page comes up it will default to the latest data release, which shows the adult weekly listening for every station on the survey. There is a drop down menu if you want data prior to the current quarter. Can you tell me how many people listen to a specific programme? RAJAR collects listening data by quarter hour between 06.00 and 24.00 and by half hour between 24.00 and 06.00. This information is available from RAJAR by subscription only; please click here to see costs. Detailed station data, including programme listening is copyright to the station we do not publish this. If you call the radio station concerned they may give you the information. The data is their copyright. Can RAJAR run me a data report? Unfortunately RAJAR is not able to handle data requests for reports. With a subscription you would be able to run your own reports or access the subscriber area of our website depending on the level of subscription you take out. Can you provide information on station formats? RAJAR has no input in this area. You will need to contact the stations direct to obtain this information. How far back in time do you have data for? RAJAR has been monitoring data since 1992 for both commercial and BBC radio stations. Prior to that data was collected for the commercial radio stations by JICRAR. The BBC ran its own telephone panel survey on a day after recall basis up to 1992. RAJAR publishes data from 1999 onwards on its website; data prior to this is not available as survey methodology changed. See the About RAJAR section for an explanation of the changes. Why can't I get into ranker, trends or maps? To access this data on the RAJAR website you need to be a RAJAR subscriber. For radio stations that wish to join the survey, please see the rate card of prices, which is based on the size of the TSA (Total Survey Area). For non-broadcast subscribers there are different subscription levels depending on the level of data access required. See the ratecards for details of the fees. Can you tell me how many people listen to radio via the Internet? The survey currently asks people if they have listened to radio on the Internet and whether it was a UK national, local or a station from overseas. Respondents are also asked to record which platform (AM/FM, DAB, DTV, and Internet) they used when listening to a station during the diary week. Listening broken down by platform is only accessible via a planning system subscription. Why are the figures not available free? E.g. in my library. The weekly adult listening figures for each station are free and available in the Quarterly Listening section of this site. Libraries are quite at liberty to become subscribers to receive our data and have it available in their education centres. RAJAR does not issue paper reporting. How can I join your survey panel? You cannot volunteer to join the survey. The seven day listening diary is placed with individuals across the UK using a different sample each week. Selection of respondents is carried out by the research contractor. Each area must contain respondent’s representative of the population in the area. Do you have data for TV viewing? Can you give me listening/viewing figures for the whole of Europe? 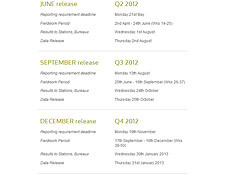 If you click on the Release Dates section of the website all our data release dates are listed. When does the next sweep start/finish? Click on the Release Dates section of the site and you will find the fieldwork dates listed. I am a subscriber and I cannot find my password/ have lost my password. Please email us on info@rajar.co.uk with you full details (including phone number) so that we can get back to you. Do you measure hospital and student radio stations? Due to the highly specific nature of their requirements, RAJAR does not measure hospital or student radio stations. Do you measure community radio stations? RAJAR will consider applications from Community stations. Due to the highly localised survey requirements, it is unlikely that existing sample points are already in place requiring a specific cost to be calculated for each application. Can a charitable not for profit station get a discount on fees to join the survey? Unfortunately as RAJAR is a not for profit organisation we are unable to offer a discount to charitable stations wishing to join the survey. 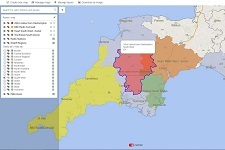 How many diaries are placed in Overlap areas? Do I get less good ratings because there are more diaries in the outskirts of my TSA rather than the core? ....and even if the weighting deals with it, doesn't it mean that we are weighting results that are skewed against me to start with? As above - the weighting means that the results that are "skewed" make a lesser contribution to your overall results than the "un-skewed". ....and how do I know we are getting a balanced set of postcodes in the core? We go to great pains to map out each segment so that sample points are distributed equitably in terms of distance and direction from the center, as well as balancing the sample points in terms of type of residence, ethnicity, social grade of area etc. to ensure we represent the area fairly. What happens if a group of postcodes with low listening are picked which are not representative of my audience? The selection is random outside the above controls and although we weight everyone to balance the normal things (working status, household size, age, gender etc) it is a random sample and we cannot balance in terms of how much they listen or to what. Sometimes the sample for a quarter works out a bit more favorably, other times less favorably, but over time the results give a true representation of the station's health. This is called "sample error" and is a fact of life in survey research. Think of it like tossing a coin ten times. You should get 5 heads and 5 tails each time, but often you'll get 6 of one and 4 of the other, or even worse. But the more times you toss the coin, the more likely you are to get a correct result. **Please note we boost core London by 500 diaries per quarter. For any Student enquiries please email Lyndsay@rajar.co.uk, a Student Pack can be provided on request. This includes trend analysis; All Radio Listening Charts, Comparative Data Charts and Volumes Tables (including a breakdown by demographic) . Unfortunately, we cannot provide Programme specific data nor in depth information to anyone who is not a Subscriber to RAJAR. Unfortunately we are unable to give interviews or opinions on the radio industry or the stations broadcasting. RAJAR welcomes interest from the academic world and frequently supports Universities and centres of learning with relevant media courses, and where requests are based on helping multiple students. We will respond to requests made by department heads on a discretionary basis, subject to resources.